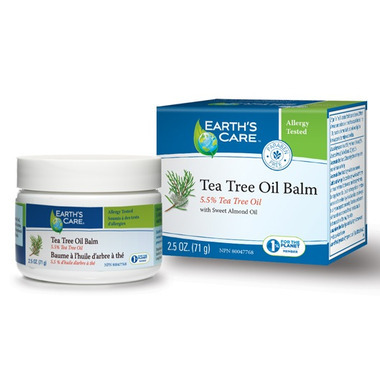 Earth's Care Tea Tree Oil Balm with Sweet Almond Oil temporarily protects and helps relieve minor skin irritation and itching. About Tea Tree Oil: Tea Tree Oil is produced from the crushed leaves of Melaleuca alternifolia, a tree species native to the northeast coast of Australia. In the 1920s, researchers discovered that the pale gold-colored liquid has beneficial properties for a variety of skin conditions. Recommended Dose: Adults: Apply to affected area as needed. Earth's Care® donates 1% of its worldwide revenue to organizations that work to preserve and protect the environment. Cautions and Warnings: For external use only. Avoid contact with eyes and mucous membranes; if contact occurs, rinse thoroughly with water. Do not apply to broken skin. Consult a healthcare practitioner if symptoms worsen or last for more than 7 days. Consult a healthcare practitioner prior to use if you are pregnant or breastfeeding. Discontinue use if excessive skin irritation develops or increases. If irritation persists, consult a healthcare practitioner. Store away from children. This is an excellent alternative to antiseptic/antibiotic cream. Keeps my daughter's eczema from getting infected.